Archival photo from a protest in January, 2017. Source: Greencastle Community Voices Facebook page. 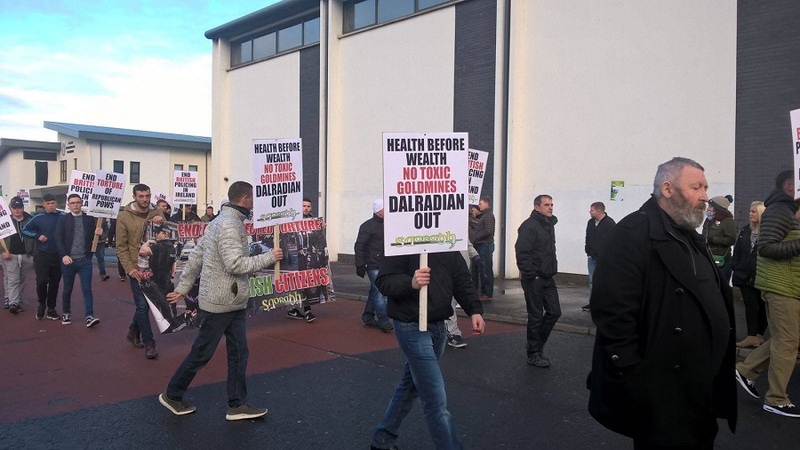 Anti-mining activists from Cookstown, Northern Ireland, were escorted out of a hotel by police after they tried to enter an invite-only conference where they thought representatives from Dalradian Resources (TSX:DNA) (LON:DALR) would be in attendance. The protesters belong to a group called Greencastle Community Voices and, together with another local organization called Save Our Sperrins, they oppose Toronto-based Dalradian’s plans to build a gold mine at Curraghinalt, in County Tyrone, due to its potential environmental impact. Dubbed “The Future Search,” the event the activists broke into is being held this week under the sponsorship of four different local governments, which spurred the activists’ fury. They say that there was a lack of transparency in releasing both the guest list and a detailed account of how the district councils involved are spending the £40,000 destined to cover the costs of the meeting. “This conference is being sold as a forum to reach compromises between stakeholders but as far as we can see this is simply a means to facilitate the unwanted industrialisation of our region of the Sperrins. What compromises have Dalradian or SSE ever made to the people of this area? We don’t matter to them. These companies can promise the planners that they will only build a small plant or only erect 10 turbines as a ‘compromise’ but everyone knows that once they have a foothold in the region they will pursue further planning amendments to achieve their ultimate goals, leaving the hoodwinked taxpayers wondering where it all went wrong,” Greencastle members wrote on their Facebook page. In response to such allegations, a spokesperson for the Mid Ulster District Council told the Belfast Telegraph that the event is designed to bring together representatives from the community, voluntary, public and private sectors with the idea of “establishing common ground and agreeing next steps towards the sustainable development of a valued and valuable natural asset." On this note of resource development, Canada's Dalradian is advancing applications to build a mine expected to produce 1.36 million ounces of gold and 380,000 ounces of silver, using an average overall gold recovery of 94.3% over the time frame. 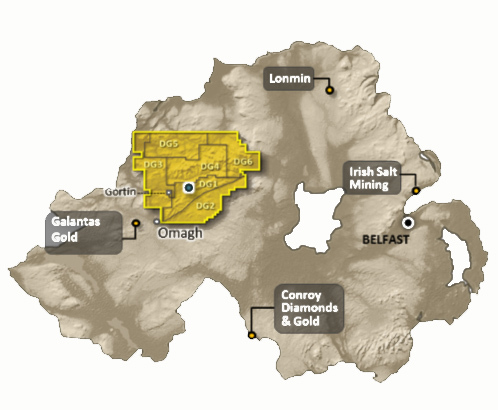 The mine would be located at Curraghinalt, which is considered to be one of the world’s top ten undeveloped gold deposits by grade.